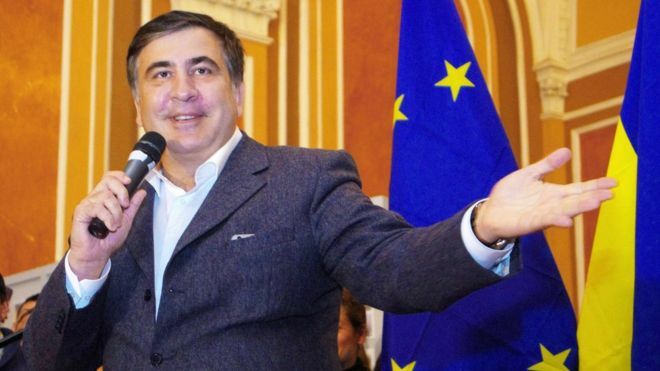 Mikheil Saakashvili, the former Georgian president, has been stripped of his Ukrainian citizenship, Ukraine's migration service has said. In a statement (in Ukrainian) on Wednesday evening, Ukraine's migration service said that "according to the Constitution of Ukraine, the president takes decisions on who is stripped of Ukrainian citizenship based on the conclusions of the citizenship commission". Meanwhile, Mr Saakashvili posted a video on his Facebook page, saying that he was "being subjected to the same approaches that are used by Ukraine's prosecutors or bureaucrats against regular Ukrainians, whose rights are spat upon". "I have only one citizenship, that of Ukraine, and I will not be deprived of it! Now there is an attempt under way to force me to become a refugee. This will not happen! "I will fight for my legal right to return to Ukraine!"